Powerful white or gray anticorrosive metal primer, which ensures long lasting protection against corrosion. It is easily workable and offers high coverage. It has exceptional adhesion strength, it spreads perfectly and dries quickly. When used as anticorrosive agent, it protects properly prepared metal surfaces, such as railings, doors and any kind of metal construction. Apply it in one coat on walls and ceilings saturated with nicotine and soot, after sweeping the surfaces thorougly. Apply it also on surfaces with black spots due to moisture, as well as on whitewashed ceilings or surfaces coated with organic glue. 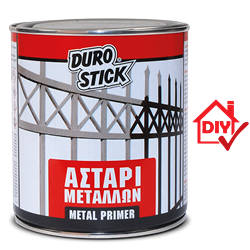 Just a coat of METAL PRIMER of DUROSTICK is enough to create an effective barrier and properly prepare surfaces for any application of paint. 1kg/8-14m² per coat, on properly prepared surfaces.